Jon designed a beautiful ring for me for Mother's Day this year. While I have felt my emotions since I've received my ring, I haven't been able to put words to them quite yet, so I apologize for my scattered writings below. I knew Jon was planning this, because he told me after he had visited the jewelry story what his plan was. Since he is somewhat color-blind, he wanted to make sure that the stone colors he chose I agreed with. So, off to the jewelry store I went to look at the stones. I made changes to two of them, and worried that Bella's stone wouldn't be pink enough, as apparently pink diamonds are extremely hard to find. 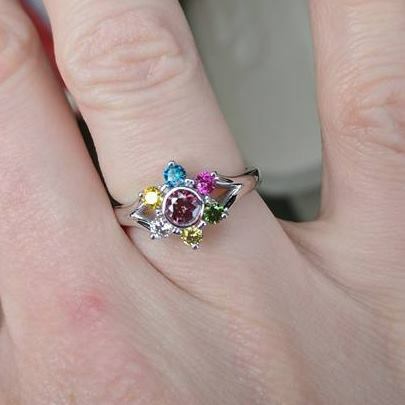 So much so that our jewelry store removed the price from their list and told us they were unavailable, so we had to order a pink/purple diamond. The designer sent us a mock-up of the ring, neither Jon nor I felt it was right, and the designers went back to work. The designers sent Jon design #2, and Jon was happy with it, so said he wasn't going to show me the design. That changed that same day and he sent me the picture. He then asked me if I wanted to receive my ring earlier than Mother's Day or if I wanted to wait until the actual day. I told him I preferred to wait. Fast forward to April 28th. Jon came home early fro work with a bag from the jewelry store, and I confirmed that I didn't want the ring until Mother's Day. Jon forbade me from the living room and he showed the ring to Lucy, and I later found out via pictures that he put it on her finger to wear. Lucy wanted to give me the ring right away, and I said no. When Gus got home from school, Jon called him into our bedroom to show him the ring. Within minutes, Gus and Lucy walked out to the kitchen, each holding a handle on the jewelry store bag, saying, "Please open the ring." So, I opened the ring. I feel guilty about my response, as I know Jon was really looking forward to giving me my ring. The first thing I noticed was that Bella's stone didn't look very pink, but more purple. In my mind, Bella is a true pink, baby pink, light pink, not purple pink. Jon told me that it looked way more pink in brighter light. In my heart I felt it just wasn't right, but how do I Jon that? I put the ring on and wore it for a little bit before realizing that it wasn't the right size. I had confirmed the size with the jewelry store, so it wasn't as if Jon had guessed at my size and was incorrect. I headed to the jewelry store the next day to get my ring sized. Turns out that I should have gone through the fitting process before having my ring made, as I needed to go down half a size! This past Wednesday, May 3rd, the jewelry store called and said my ring was ready, so Gus and I secretly went to pick it up. It was the right size, and in the bright lights of the jewelry store, Bella's stone looked more pink than I had remembered. This made me happy. Gus and I returned to the car and I took some pictures in the sunlight, which enhanced Bella's pink even more. It is now very early Saturday morning, and I love my ring just the way it is, thus my feeling guilty for my original reaction to receiving it. Bella's stone is not as pink as I had originally pictured in my head, but it fits her and our family so well. Jon and I feel that Bella would have been a diva (even before this ring being made) and would have enjoyed being on stage. Turns out we were right, and Bella will only shine her brightest when she has the right light. In thinking about my emotions I've felt for my ring, my thoughts are scattered. I wish all of my kids surrounded me, rather than having this symbolic piece of jewelry. I love that this is a piece that I will never take off (unlike my necklace and bracelet), and that I can see it easily, so can send love to my kids much more frequently. I love the meanings behind Jon's design: 1) us in the center with our kids surrounding us and 2) we are all made from the same stones, but different in color, because we are all part of the same family, but unique in our own ways. While our family may not be together, because half of us are always missing, in this ring, my mother's ring, our family is complete. Tittle's green, Gus' yellow, Firefly's white and Lucy's gold diamonds surrounding us. I have also found out that Jon has envisioned this ring for YEARS, but wasn't able to find the right stones in the right colors. He knew he wanted them to all be the same stone type, since we were all the same family. I love him. I love how much he loves me and our kids. I am so grateful that he's my husband. Wow that is so beautiful!! What a beautiful gift....and I don't think you should feel bad for your initial reaction - it's more than just a stone, it's how you envision her, and that has to be hard to get right. It turned out beautiful and can I add - he is so thoughtful! Thank you so much. He is so thoughtful. And this is not the first piece of jewelry that he's designed for me. He has quite the gift for giving thoughtful and meaningful gifts.